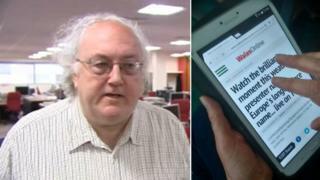 Individual website "click" targets for reporters at Wales' main media group could encourage them to sensationalise the news, a union has warned. The NUJ wants assurances from Trinity Mirror, which runs Wales Online and the Daily Post, that it is not dumbing down into "celebrity-focused 'click bait". The Connected Newsroom strategy will include the targets from January. The group said concerns were unfounded and the focus is on content that audiences want to read. Martin Shipton, chairman of the NUJ's Trinity Mirror group chapel, said the announcement was made along with the net loss of three editorial jobs in its Cardiff newsroom. "The group's strategy for audience growth is based on greatly increasing website clicks - yet reducing the number of writers will make that more difficult to achieve," he said. "We are extremely concerned by the potential implications of setting individual click targets for journalists. "At its worst, this could encourage reporters to sensationalise stories, to trivialise the news and make news out of trivia, and to give up on more challenging, public interest journalism that takes time to research and deliver." Trinity Mirror said the concerns were entirely unfounded and said important stories would still attract readers. "The ambition is to grow our local and engaged audience by sharpening our focus on providing content that is relevant to our audiences through the channels that suit them," said Neil Benson, editorial director. David Higgerson, responsible for Trinity Mirror's regional websites, has written how the changes are not about chasing clickbait but about understanding what readers want - and this did not sound the death knell for investigative reporting. "Data tells us that people value both the journalism which takes time and effort, and the stories which are quicker to produce too," he said. Image caption Clickbait? Or headlines that grab the online reader - and grow the audience? While clickbait generally refers to the more provocative, sensationalised stories, the competitive online news market means all providers must attract an audience. The principles behind clickbait aren't new. Since the infancy of print journalism, tempting headlines have enticed readers to buy papers, or more recently to click. For commercial news organisations that still rely largely on advertising revenue, it's hardly surprising that journalists are expected to do all they can to attract an audience for their work. But it's the suggestion that reporters' performance will be measured by the impact of their story that's got politicians worried. Not every headline from the Senedd has the power to pull a crowd, and after previous warnings about the plurality of Welsh news sources, there's concern that journalists monitoring their clicks will focus only on the most populist stories, and allow the "democratic deficit" to deepen. The publishers couldn't be clearer - falling newspaper sales means their futures depend on digital growth. It's not unreasonable to expect journalists to write compelling copy, they argue, or for online headlines to be snappy and enticing. While editors may be counting clicks, the politicians will be monitoring articles to see if the less sensational Senedd stories are still published online under the new regime. But Welsh Conservative leader Andrew RT Davies AM said the plans could have "disastrous consequences for Welsh journalism and in particular coverage of Welsh political institutions". Liberal Democrat culture spokesman Peter Black AM has written to Trinity Mirror's chief executive expressing concern. "A story about someone spotting a Kim Kardashian look-alike in Gorseinon could well get more clicks than an article about underinvestment in Wrexham's mental health services, but without more stories like the latter there will be fewer opportunities to drive forward improvements to public services," he said. Plaid Cymru also fears a "race for website clicks". Dr John Jewell of Cardiff University's school of journalism, media and cultural studies, said newspapers had always been businesses which needed advertising and answered to shareholders. But even with a changing media landscape it was still possible for serious news to co-exist with trivia. "It's not necessarily a race to the bottom," he said. "If you look at BuzzFeed for example - we know it for listicles but behind that there has been real investment in serious journalism, foreign news and sending reporters out to war zones."